Earl Thomas’s season-ending injury, and his halftime tweet, left many unsettled. But with both lines operating near maximum efficiency against Carolina, any sense of crisis was undetectable. News of the loss for the season of FS Earl Thomas to a broken leg hung for awhile in the cold air the Clink Sunday night. A 23-7 lead over the the irascible Carolina Panthers was worthy of some delight, but the mercurial Thomas’s tweet from the locker room about considering retirement shot through the crowd via smartphones like a fork in an electrical outlet. Then came a jolt of a far different kind — on the first scrimmage play of the second half, WR Tyler Lockett’s 75-yard end-around for a touchdown was about as thrilling as a Usain Bolt Olympic dash. A wave of adrenaline drowned the sadness. Lockett’s jet down the sidelines outpaced defenders who had angles, leaving all slack-jawed. Um, no. Even Lockett couldn’t run like that this season, until that moment, thanks to leg injuries that diminished his explosiveness. “I thought if I get caught, I’d never hear the end of it,” he said, grinning. Lockett was back. So were C Justin Britt, DE Michael Bennett, CB DeShawn Shead and LB Mike Morgan. So was the old-time Seahawks swagger after a 40-7 walloping of the Panthers that followed by one week a pitiful 14-5 loss in Tampa to the mediocre Bucs. The loss of Thomas was a serious blow, because the Seahawks’ cover-3, single-safety defense is based in part on Thomas’s unique ability to run exceptionally fast from sideline to sideline. Backup Steve Terrell is an admirable replacement, but no safety in the NFL is Earl Thomas. The compensation for Thomas will be a story weeks in the telling, yet shouldn’t dwarf the accomplishments of the evening. Before an NBC national audience, the Seahawks reasserted hegemony over the team that buried them with a 31-0 first half in Charlotte in a playoff elimination. They also buried the Tampa defeat with a devastating running game and a defense that stifled QB Cam Newton, whose pre-game wardrobe malfunction added low comedy to a season already high in distraction. The Panthers gained 89 yards in 21 carries, much of it late in when the element of contest vanished. Throwing, Newton was 14 of 32 for 182 yards, 55 of which came on a single, second-quarter touchdown pass to Ted Ginn Jr. on the play after Thomas went out when the Seahawks made an assignment error. The biggest joy of the evening for Seattle was the offensive line blowing holes for RB Thomas Rawls, who had two touchdowns in his 106 yards on 15 carries. The comfort level with Britt over rookie Joey Hunt, making his first NFL start last was week, was startling. Primary beneficiary was Rawls, who said he woke up Sunday morning feeling loose, limber and much more prepared to run his usual slash-and-bash style. “I felt like I could make some cuts I wasn’t making,” he said. “I could trust my eyes and the big boys up front. Rawls is in only his second year, and really hasn’t logged a full season of 16 games. He’s still making errors that will diminish over time. It’s a feeling familiar to anyone over about 30, but most of us aren’t being chased by mean, 300-pound men. The near-shutout by the defense, and the rebound by the O-line, invigorated everyone in blue. The Seahawks enter the season’s final quarter at 8-3-1, closing against four foes who don’t have winning records. True, they won’t have Thomas. They do have almost everything else figured out. His teammates just have to tell Earl to hang in there, get better and be available for the Super Bowl! 2:05 AM? Anyone over 30 feels that as well. This is football. Seemingly irreplaceable stars get hurt and sometimes the replacement turns out to become another star being born. We’ve seen that happen more often than not on Pete’s teams. With all I’ve heard said about Earls replacement, well, this could get interesting. They’ve done well in that department. 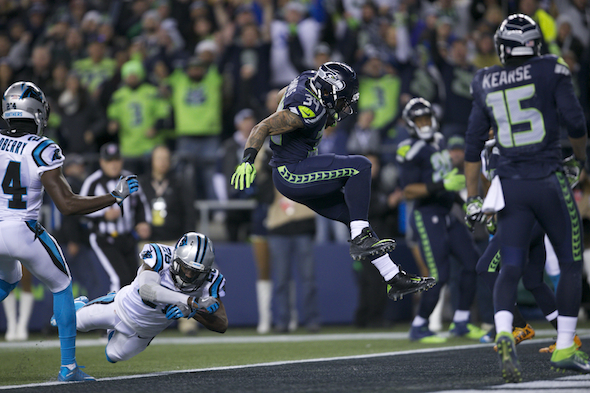 But the SB was lost when Thomas, Sherman and Chancellor were debilitated from earlier injuries. That’s how Brady completed 13 of 15 in the 4Q. Anyone over 30? I’m qualified. At 60 my body and my mind are at frequent loggerheads over the next step. Great post, Art, again. I almost felt bad for Cam Newton last night – the operative term is “almost” – for being in a room with approximately 70,000 people who personally dislike him for being rude and ungracious in both victory and defeat. It’s an easy trap to fall into when you have Russell Wilson as a point of reference. Such a dumb thing to cause embarrassment. Unless it’s a tip of the iceberg moment between coach and player. Newton has been hero-jock and adored most of his life. Some have the character to handle it, many don’t. Should make people around here more thankful we’ve got Wilson and Carolina doesn’t. I like Terrell, but Carroll was right, there’s only one Thomas. Terrell will be getting plenty of work . . .
Cam’s “wardrobe malfunction” is not exactly a world-shaking crisis. Apparently the issue was that Cam failed to wear a tie while traveling. OK, fair enough, since players knew the rule. The problem is the rule itself. While forbidding ragged jeans and T-shirts is reasonable, as far as I am concerned, requiring players to wear ties is light-years beyond ridiculous and totally unacceptable. You’ll never play for Rivera, pal. Think about THAT. No. Same logo, different team. Same franchises, but no team is identical even from week to week. Don’t be so fussy. Say you liked the column. I like all your columns and especially the fact that you find time to play in the sandbox with us. Keep up the good work. Hey, I’ll take cheap pandering. You made my evening.